I am currently on holiday in Seoul, Korea with my family, last week we took a four day trip to Jeju Island at the South of Korea. It’s an easy one hour flight from Gimpo Airport Seoul. Jeju Island is one of the 7 new wonders of the natural world and a beautiful place to visit. Prior to our visit I had scheduled to run in the Jeju Marathon Festival on Sunday morning before we leave back for Seoul. With a marathon, half marathon, 10km and a 10km walk the race attracted a large amount of competitors. I decided on the 10km as it’s an easier event to plan for and recover from whilst on holiday and doesn’t take up too much time. We arrived at the race about 40mins before the 10km start at 9:10am with the Marathon and half going together 10 mins earlier. The race started and I went after the first few hundred metres I found myself in third place. I settled in here and went through the first kilometre in 3:35 min/km. 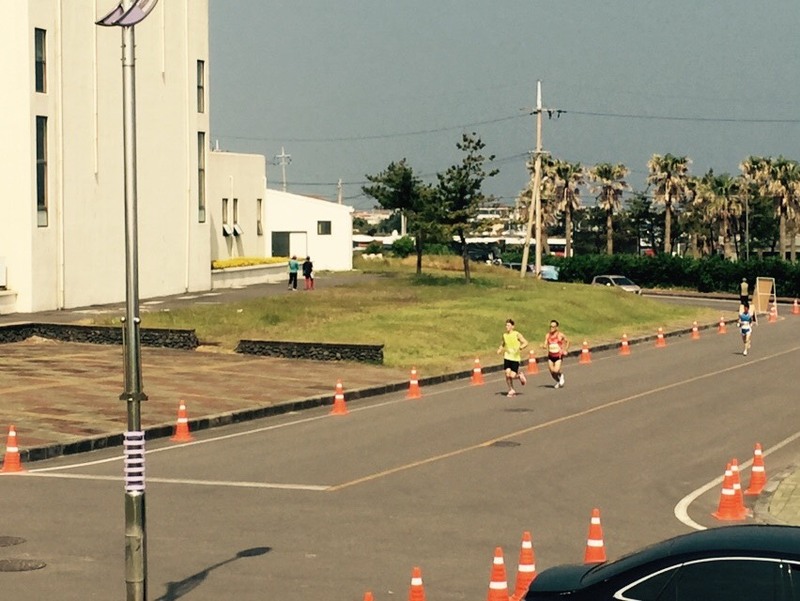 The course itself was a simple 5km out and back course along the coastline of the Gimneyeong area of Jeju. It’s a nice course with views of the coastline,the local town and the vast amount wind power generators. There was decent wind blowing early in the morning but for the first 5km it was at my back. During kilometres 2-5 we caught up to the back markers of the marathon field. This made for some congested roads as we passed runners on the way to the turnaround. I went through the turnaround at 5km in 2nd place at 18:50. I was happy with this effort as I was hoping to run something near 38 mins for he 10km. In 2nd place I was aware that the 3rd and 4th place runners were not far behind, I needed to keep my pace high to keep them at bay. Over the kilometres 6-8 there was quite a headwind, my pace for these kilometres dropped a bit, I was still feeling strong and keeping the runners behind me at the same distance though. As we returned running against the runners we had passed earlier there was plenty of support. A lot of the messages of support I couldn’t understand due to my limited Korean but it was nice to feel the camaraderie. Over the final two kilometres I could feel and hear the runner in 3rd place begin to get closer to me. His breathing was loud and with almost every step I could feel it getting louder. At this stage my strategy was to continue at the pace I was running and give it everything I had if and when he caught me. He was catching at a huge rate of knots so I knew if he caught me I could raise my effort and hopefully stay with him till the finish. I was also hoping this wasn’t going to happen until very close to the finish. He did catch me with about 500 metres to go. He came up alongside me and I gave it everything I had for about 100 metres, this was enough to keep him behind me. I kept my pace as fast as I could run over the last 400 metres and held off for a nice 2nd place in 38:42. Little bit slower than I’d hoped but the wind over the second half of the race was challenging. After the race the Korean hospitality was fantastic. 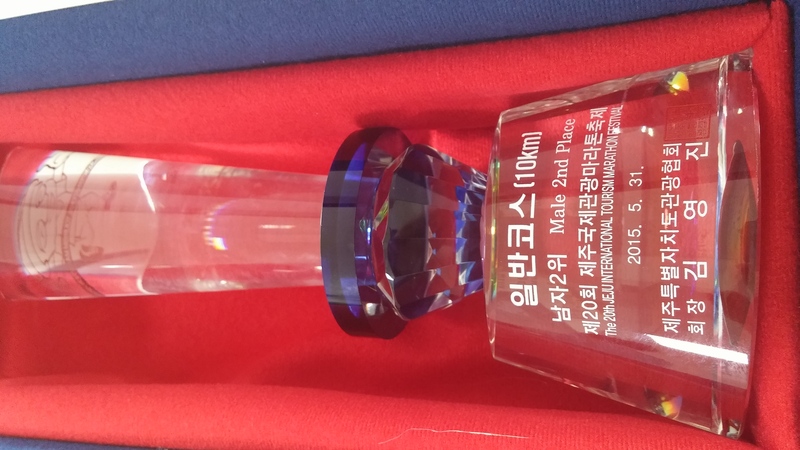 There was drinks, food, massage, cold showers (ouch), a medal and gift towel all for my 20 000 Korean Won or $22 Australian Dollar entry fee. I was also asked to stay for the presentation for my 2nd placing. I stayed for the race to receive a trophy and embossed certificate and unexpectedly a 150 000 Won voucher at the Shinsegae department stores in Korea. I’d really recommend this event to anyone that is in the Jeju area or want a fun holiday race. Jeju Island is spectacular in its own right and this race really topped off a great few days I had on the island. Time to fit in a run. Well done – great recap too! Interesting report and congratulations on the place. I’m considering running the marathon next May when they run it. Congratulations on this tremendous finish. Your recap description had me right there, hearing the breathing of the 3rd runner right there behind me.